This newspaper template use Side by Side Post format, like a newspaper. At main page, you can get your post appear side by side. You or your visitors can read full post by click 'Read Full' at right bottom of each post column. good btw i cant find your Shoutbox where is it? 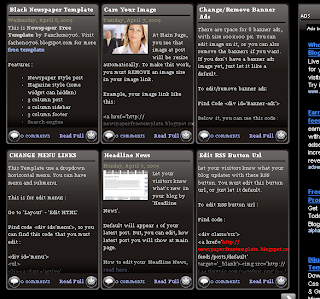 tHANKS to make excellent blog template like this. I really upset to use it, please anytime come to my blog to give advice to me.